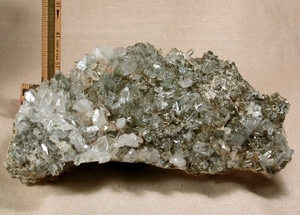 Monumental large cabinet size [9x 5x 5" high] Arkansas quartz cluster of green chlorite phantom, green-and-tan phantom crystals, clear, white and rainbow crystals which are needle [rare], twinned, penetrated and in parallel growth to a largest 3/8x 1-1/2" tall. Much regrowth is going on on the cluster's front side: what makes chlorite crystals and clusters much more friable than others is up for speculation, but large clusters are rare. Apart from small amounts of remaining impacted clay, this cluster is a mass of solid crystals with no matrix. Self-displays safely, with a reverse side of much textural interest and several crystals - occluded and clear - showing through shades of tan, sand and darker green. Energetic, held to be superior for healing, and vibrant, with no damage.